Tasty Brand specializes in organic fruit snacks. 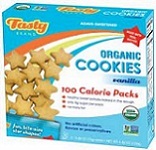 See 252+ Tasty Brand Reviews and save an extra 10% on Tasty Brand with Coupon Code* YAG250 at iherb.com/Tasty-Brand?rcode=YAG250. Nutrition: Serving 40 g, Calories 130, Fat 0 g, Carbs 32 g, Fiber 0 g, Sugar 17 g, Protein 4 g.
Ingredients: Organic tapioca syrup, organic cane sugar, organic tapioca syrup solids, organic white grape juice concentrate, pectin, citric acid, organic fruit blend (organic apple powder, organic acai powder, organic blueberry powder, organic pomegranate powder), ascorbic acid, color added (black carrot juice concentrate), natural flavors, sodium citrate, organic sunflower oil, carnauba wax. Nutrition: Serving 35 g, Calories 100, Fat 2 g, Carbs 24 g, Fiber 3 g, Sugar 14 g, Protein 2 g.
Ingredients: Organic carrot apple filling (organic brown rice syrup, organic dried cane syrup, organic cane syrup, organic carrots, organic apple powder, organic rice starch, glycerin, organic apple juice concentrate, water, pectin, organic apple flavor, natural flavors, citric acid), organic dried cane syrup, organic wheat flour, organic whole wheat flour, organic whole oat flour, organic oat fiber, organic sunflower oil, organic cane syrup, organic wheat bran, organic sweet potato, (organic sweet potato, organic malodextrin, organic corn starch, sunflower lecithin), organic wheat protein concentrate, organic date puree, organic nonfat dry milk, organic vanilla extract, salt, baking soda, cream of tartar, soy lecithin. Vitamins: Niacinamide, Vitamin B6 (pyridoxine hydrochloride), Selenium, Vitamin B12 (cyanocobalamin), Vitamin B2 (riboflavin), folic acid, Vitamin B1, (thiamine hydrochloride). Allergen Information: Product contains: Wheat, soy, milk – produced on equipment that is used to produce products that contain: eggs, peanuts and tree nuts. Food manufacturing practices are used to prevent introduction of undeclared allergens.